Them’s Fightin’ Herds is a 2D fighting game funded through Indiegogo in October 2015 that is finally getting a release on February 22. The game was directly inspired by My Little Pony: Friendship is Magic, and raised just under $600,00 from over 10,500 backers. This is the first game by developer Mane6, and of the many games being published by Humble Bundle. 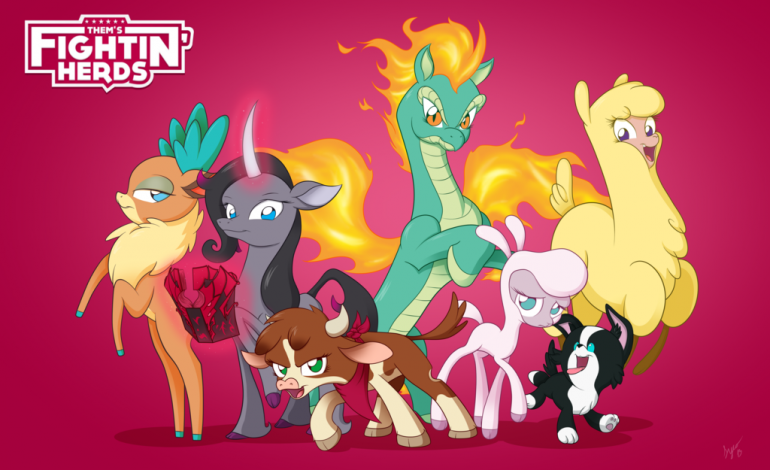 The “original universe” designed for Them’s Fightin’ Herds was designed by My Little Pony producer Lauren Faust. My Little Pony used to be a hotbed for fan art in the past, and this game is set to be a spiritual successor to Fighting is Magic, a fan-made adaptation of the cartoon from 2013 that was shut down by Hasbro. Them’s Fightin’ Herds utilizes the standard four-button attack modes, which includes light, medium, heavy, and magic, but also managed to include its own flair with a mechanic called juggle decay. This mechanic triggers opponents to become gradually heavier during a combo after the juggle decay bar fills. This assures a combo length attack without imposing too hard of a limit. Each character has unique abilities that correspond to a specific enhanced super attack, which can be achieved by spending an additional meter to activate. The game comes with an online social hub that can be used for players to hang out in between matches. Different locations can be explored, and ponies can be customized with items collected through exploration during single or multiplayer. Matchmaking can be both ranked or unranked for optimal fighting, and a GGPO powered netplay, which is utilized in various fighting games, will ensure a smooth experience. A dynamic music system is also introduced within the gameplay that reacts to attacks, combos, and blocks. During a moment of heavy combos, the music speeds up with the punches. Them’s Fightin’ Herds can be picked up on Steam for Windows and Linux on February 22.